Cleaning your Chicago apartment should ideally occur on an everyday basis. It only takes a few minutes to wipe down the counters, pick up your dirty clothes and make the bed. These help set the place in order, and believe it or not, they actually make your apartment safer. Disinfecting the counters from last night's chicken dinner means you won't get salmonella from this morning's breakfast. But deep cleaning is different from regular cleaning. 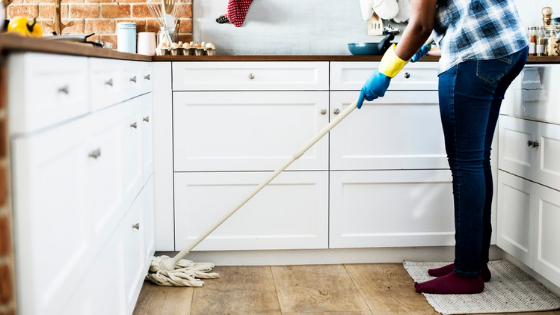 This term refers to a cleaning where you really dive into the nooks and crannies of your apartment, tackling everything from the spaces between your stove burners to the water stains on your shower door. It's a much more intensive job that few people are excited to try, which is why you likely don't want to do it more often than necessary. The general consensus is that you should deep clean once every 3–4 months. This includes every room and space in your apartment, from the closet to the entryway. It means taking all of your dishes out of your cabinets and cleaning the shelves and sides of the cupboards. It means dusting the tops of your ceiling fans. Deep cleaning doesn't have to be done in one day, but it should be completed within the same week. If your place tends to be messy from all your hobbies (e.g., cooking, crafting, DIY projects, etc. ), then you may want to consider doing a deep cleaning once every other month. It's easy to let certain spaces in the apartment get out of control, so this tip can save you both time and energy. If you wait too long, you may spend more time than you'd like on a single area. This can ultimately be frustrating and can dissuade you from deep cleaning in the future. If you're looking for a new place to keep clean in the Windy City, consider North Harbor Tower Apartments. We have modern amenities that were built with you in mind, so you'll spend less time getting stains off your countertop and more time doing what you love to do. If you want to learn more about our facilities, give us a call to schedule a tour!